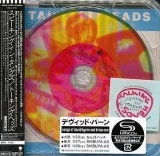 Fifth studio album, featuring Talking Heads only US Top Ten hit, Burning Down The House (including an alternative version as a bonus, and an unfinished outtake of Two Note Swivel). This version is a reproduction of the limited edition clear vinyl version designed by artist Robert Rauschenberg, who won a Grammy Award for his work. No cover - the Cd is housed in a plastic, see-through case with 3 plastic discs. From Wikipedia: "David Byrne did the cover for the general release of the album. 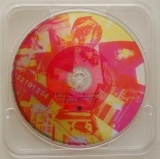 Artist Robert Rauschenberg won a Grammy Award for his work on the limited-edition album, which featured a clear disc along with three clear plastic discs printed with similar collages in three different colors." 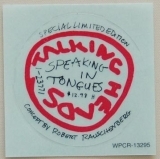 Also included is a miniature sticker, a copy of the original which would have been on the album's plastic sleeve. Lyrics:Lyric booklet in English and Japanese. 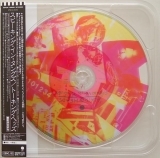 2012-08-13 - Reprint (2012-08-08) recorded by robot harry (source CDJapan).